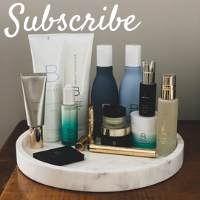 It’s September – one of my favorite months of the year! I love making baked oatmeal in the fall. It’s great hot out of the oven, but it’s also delicious reheated the next day for a super quick breakfast. There is the original banana. The coffee version. The pumpkin. And strawberry basil. 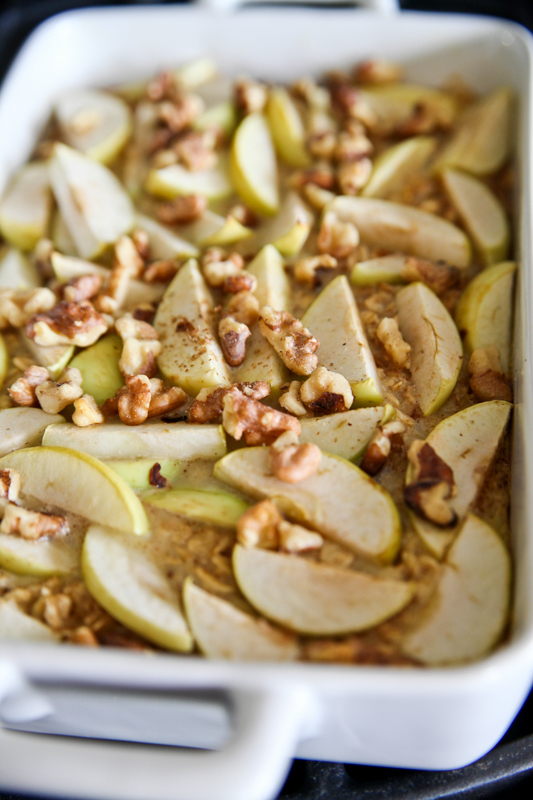 And now we have the ultimate fall oatmeal bake: Apple Walnut. All of ’em are made with Quaker Old Fashioned Oats! I love this recipe because you can change it around so easily. Mazen picked these apples straight from the trees at our local orchard. This version of the oatmeal bake includes a banana (for texture and natural sweetness), pumpkin pie spice because…well duh! Along with sliced green apples and crunchy walnuts that toast while the oatmeal bakes in the oven. Start by preheating the oven to 375°. Combine your dry ingredients in one bowl and mix well. 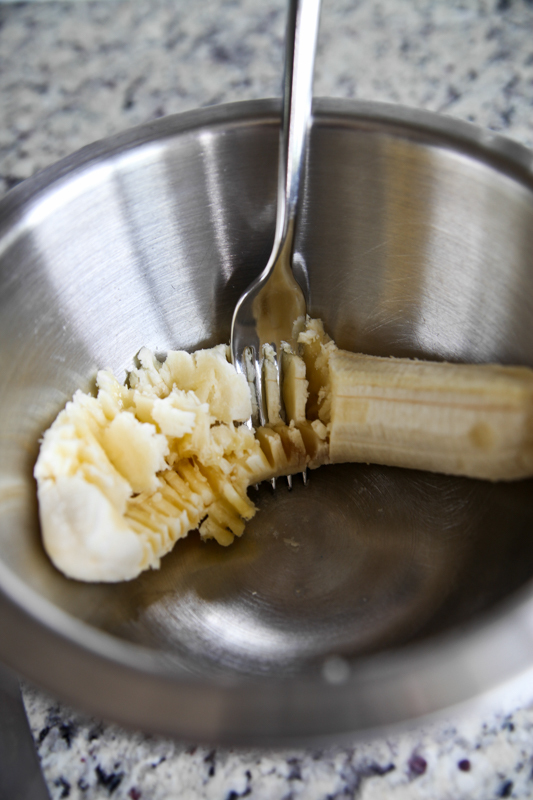 Add your banana to the wet ingredients bowl and mash well. Then add the rest of the wet ingredients. Pour the wet into the dry and mix. Don’t forget your spices! 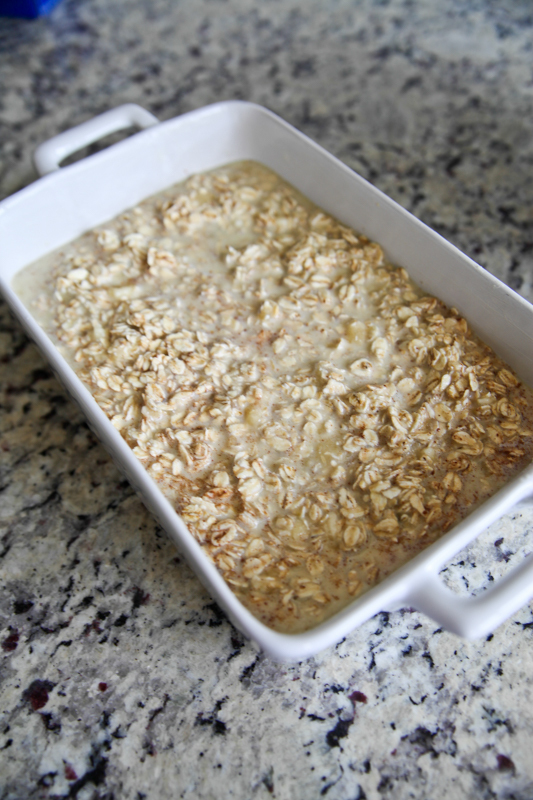 Grease a small baking dish or pie pan with butter and then pour the oat mixture in. 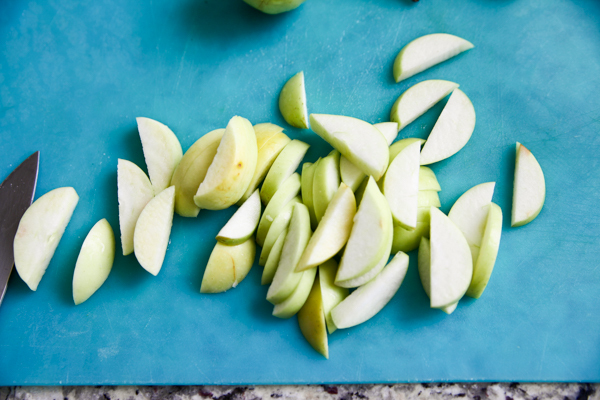 Then arrange apple slices on top and sprinkle with walnuts. Bake for about 30 minutes, until the middle is set. Allow to cool for 10 minutes or so, which will make cutting and removing the slices easier. 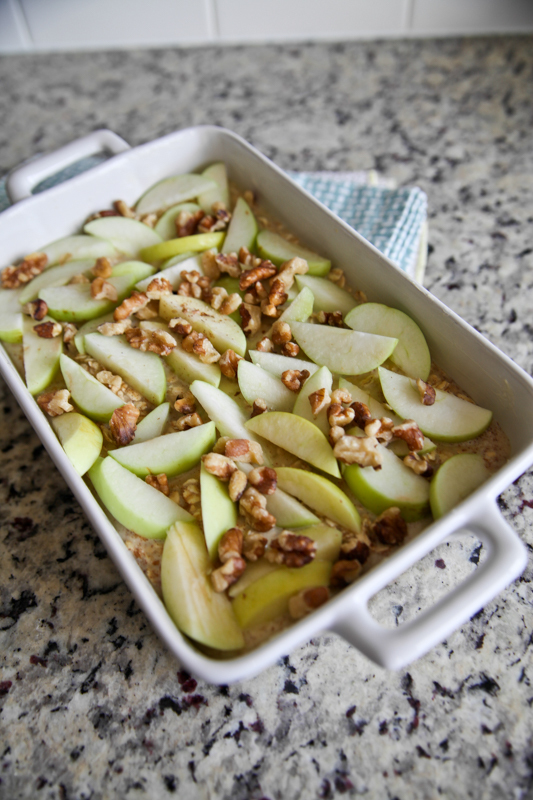 This easy baked oatmeal includes a banana (for texture and natural sweetness), pumpkin pie spice because...well duh!, sliced local green apples and crunchy walnuts that toast in the oven. Mash banana well in separate bowl and then add rest of wet ingredients. Pour wet into dry and mix well. 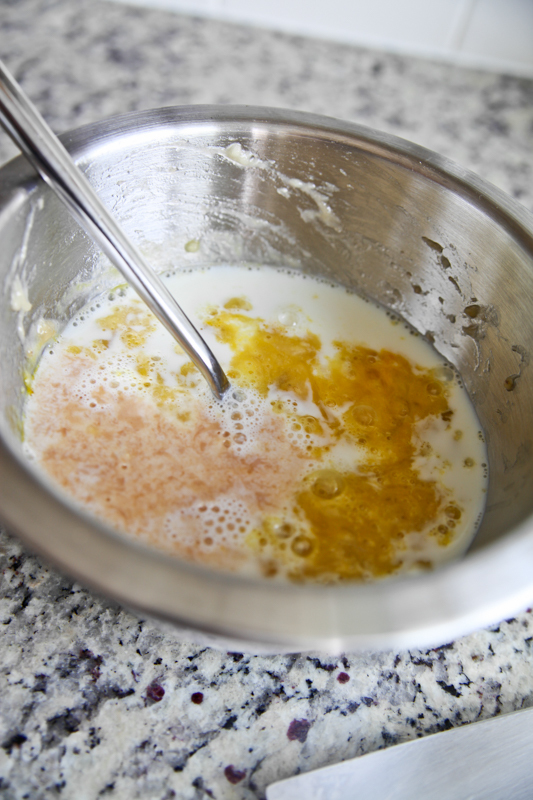 Grease a small baking dish or pie pan with butter. 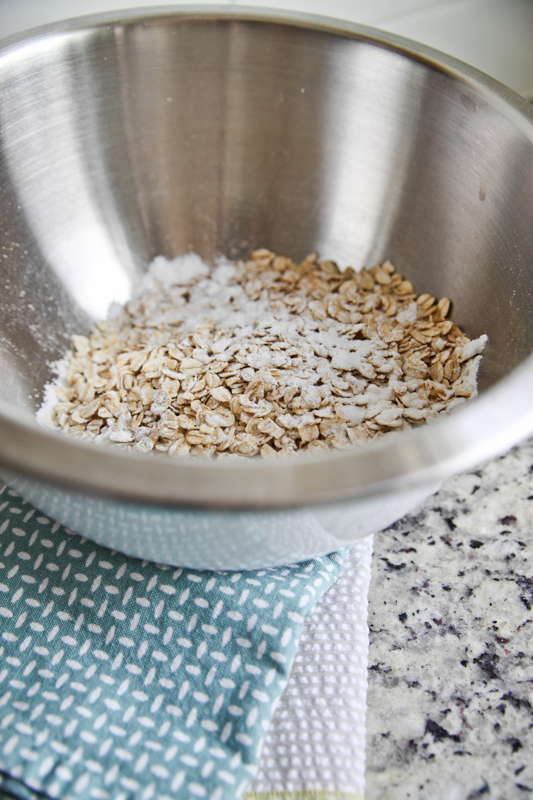 Pour oat mixture into dish. Top with apples and walnuts. Bake for 30 minutes, until center is set. Allow to cool for 10 minutes before cutting. Looks so good! Making plans again to visit the orchard there on the mountain, Carter Mountain I think that’s the name. 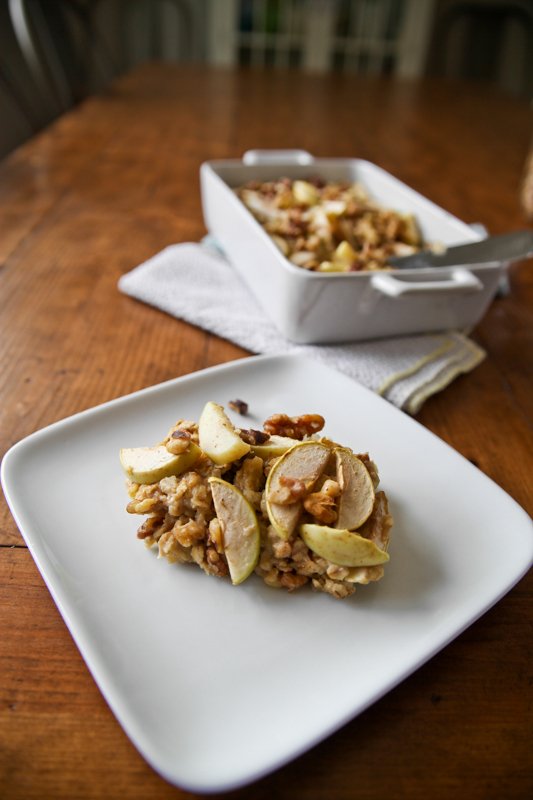 I loved the overnight apple cinnamon oats I made in the crock pot last fall. Now I want to make this. On a Sunday morning with a nice cup of hot apple cider. Looks amazing! I’m making this asap! Yum! This sounds delicious! And still healthy enough to eat for breakfast, 🙂 I’m SO glad it’s apple season! Yummm! Perfect recipe to welcome the fall time! Love the addition of walnuts on this oatmeal too! I absolutely love the pumpkin version, so I am sure this will be a winner. I love the crispy outside, but gooey inside! 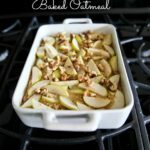 i made a baked oatmeal last week with apples on top and it was SO wonderful! 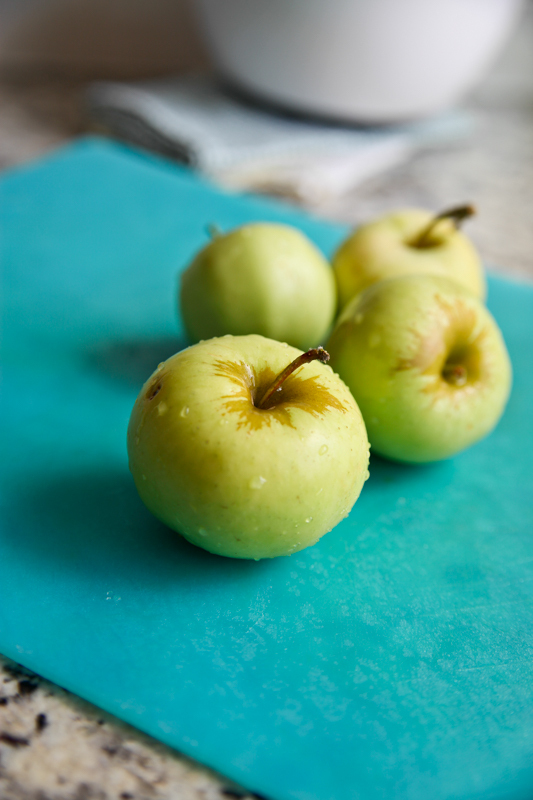 Almost like a healthier apple pie! Could you sub cinnamon for the pumpkin spice? 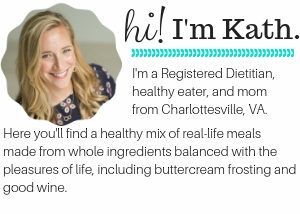 I was just talking with a coworker who was trying to find a healthy oatmeal recipe and I think I will share this with her. It sounds delicious and perfect for this time of year! I would cook the apples first in a sauce pan then put on top to bake. Wow! 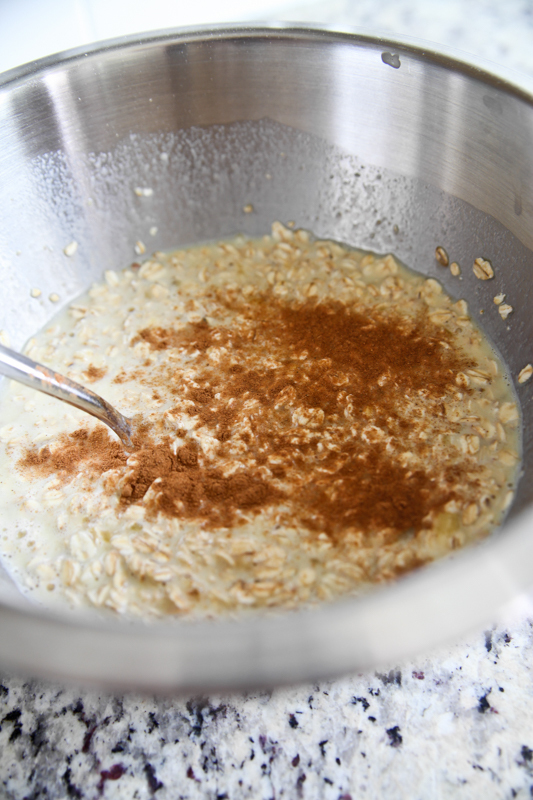 What could be better than oats with apples and pumpkin pie spice (or cinnamon)? 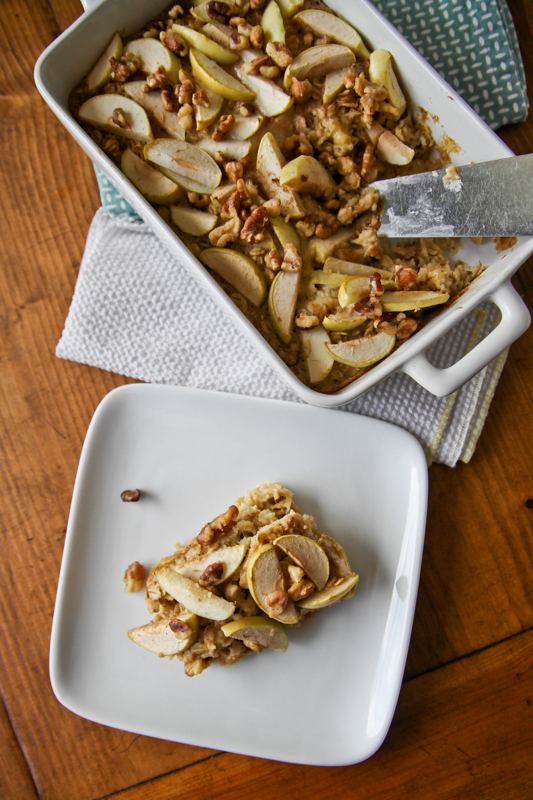 It’s almost like having apple crisp for breakfast (but healthier, of course)! What size baking dish did you use? Looks delicious! This looks like the perfect pudding now we are approaching winter. Also love the combination of fruit and nuts – delicious! Do you think it would work without the egg? I have an egg allergy and I’d like to try to make it. It looks delicious. I’m gonna try it this afternoon and let you know. It would probably just taste more oatmealy without it. It’s worth a shot. It does look delicious. Could you make this with steel oats? 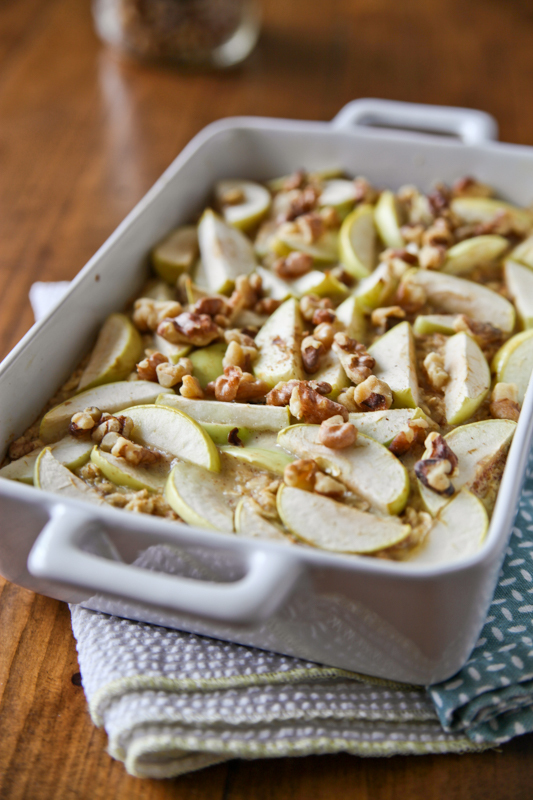 We love apple walnut oatmeal anything so we made this for Thanksgiving. Unfortunately, it was dry and bland using this recipe. To fix it for my family I added sugar, additional spices and milk.